his beat included Pukerua Bay to the north, Pauatahanui in the east and all points in between. Tawa, SA4650 Trooper George Styles from Pauatahanui and SA4657 Trooper Leo Gestro from Paremata all sailed as part of the 7th Contingent for South Africa. 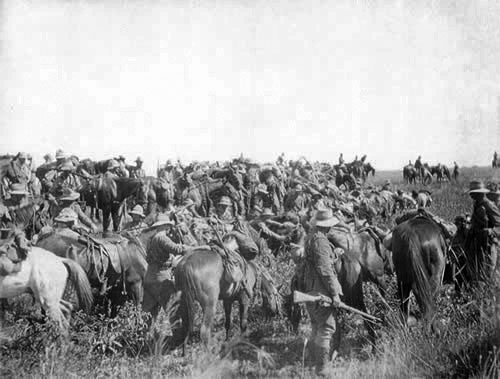 On arrival in South Africa the 7th New Zealand and the 6th Queensland Contingents were assigned to Colonel Garratt’s column operating in the Eastern Transvaal and north-east of the Orange Free State. During June 1901 there was constant skirmishing with the Boers with casualties inflicted on both at Blesboxspruit and Kaffir’s Spruit. captured along with 34 waggons, 31 carts and 1240 cattle. One of those killed in this action was SA4645 Farrier Len Retter. In late March after the year of operations, the 7th contingent started their journey to Durban and the return to New Zealand. At Newcastle on the journey home the 7th Contingent was addressed by the New Zealand Premier Mr Richard Seddon. The 7th Contingent sailed from Durban, South Africa on the 22nd May 1902.
may be the result of being charged for insolence while in South Africa. In December 1902 John was again examined and given two more months paid leave with a final examination in February 1903. At this stage John had moved from Johnsonville and was living in Wellington City. The results of the medical examination concluded no permanent illness and that light duties could now be undertaken. SA4643 Trooper John Robinson was awarded the Kings South Africa War Medal with year clasps of 1901 and 1902 and provincial clasps for Transvaal and Orange Free State. It is difficult to trace any other records for John Robinson from this date. Private and Trooper are used in Military Files and newspaper items so Trooper has been used in Porirua stories for consistancy.